Drongo birds which has adapted its habitat with human interference. Burning farm lands gives oppurtunity for the bird to capture insects.The passerine feeding on insects, swoops them during flight is also famous for its aggressive behavior and daredevil stunt. The agile bird will maneuver inside and across fire flames catching fleeing insects on the move. The extreme heat is generated during fire making it impossible for one to stand. 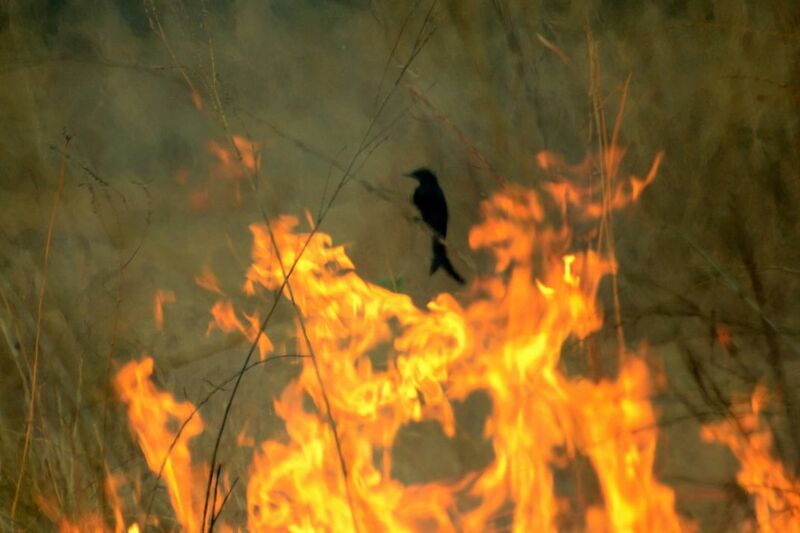 The bird which has adapted to the phenomenon easily follows the flames with its slender body, long and forked tail aiding to aerial acrobatics and snagging escaping insects.The voracious behavior of bird has proved important biological control agents controlling pest through nature process of prey and predator without disturbing the ecological cycle.